Renewed fighting in Libya and Syria could be reason why numbers have shot up in the last week. 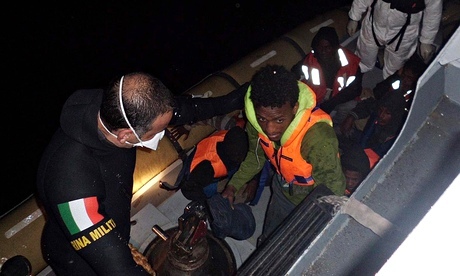 Italian authorities say they have rescued more than 4,000 would-be migrants at sea over the past four days as the war in Syria and instability in Libya spawn new waves of refugees. The numbers of migrants reaching Italian shores generally rises this time of year as warm weather and calm seas make the Mediterranean Sea crossing from North Africa easier. United Nations Refugee Agency appreciates the situation Italy is facing. But the UN refugee agency said the numbers so far in 2014 represent a 300% increase over the same period in 2013. Italian maritime officials said 2,922 people were picked up on Monday and Tuesday, and another 1,165 were rescued on Wednesday and Thursday. The spike is primarily due to renewed instability in Libya, where refugees from Syria and across Africa gather, awaiting a chance to leave on Italy-bound smuggling boats, said Carlotta Sami, a spokeswoman for the UN refugee agency in Italy. Italy increased its air and sea surveillance of the sea smuggling route after a boat capsized last October off the southern island of Lampedusa, killing more than 360 people. Nearly 43,000 migrants arrived by sea in Italy in 2013. Posted on 21st March 2014 by newsafrica. This entry was posted in Africa, Italy, Libya, Syria and tagged Africa, Italy, Lampedusa, Libya, Mediterranean Sea, North africa, Sicily, Syria. Bookmark the permalink.